If you are checking out a 2nd generation CRM system, or thinking of switching CRM, you may be enticed by anything that offers more features than you have at the moment in your currrent CRM solution. A 2nd generation CRM system needs thorough thought! Don’t settle for good enough… for another CRM solution that only makes things “slightly” better. A great CRM solution should allow you to easily manage your processes and make your business more streamlined. It should be flexible and be able to grow with your business needs, as your business grows. So when do you know if it is time to evolve your CRM solution? If you are working around the system rather than with the system, or perhaps your employees are not using it, it may be time to take the first steps to review your CRM system and see what is and isn’t working. Second generation CRM (2nd generation CRM) is all about learning from the good things you have in your CRM and building on them, whilst ensuring that the limitations in your incumbent CRM solution are removed. Migrating CRM is all about looking to the future and involving your end users, the people who will use the new CRM system, as you go. Why not take the steps to make Microsoft Dynamics CRM your 2nd generation CRM solution. and Contact us for your free CRM migration discovery meeting. We will help you to work out the limitations of your current CRM solution, and help you to realise great results migrating to Microsoft Dynamics CRM. We will work with all your users, your data and your needs to deliver a precise solution, no matter the size of your organisation. 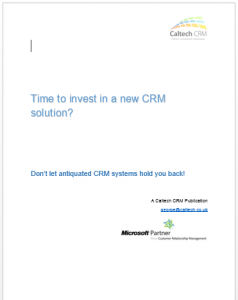 "We have been working with CRM solutions since 1999 and we know we can make Dynamics CRM deliver results for you." Phil Callaghan MD Caltech IT Ltd.